And here I am again with yet another mystery cigar sent to us from Brooks over at smokingstogie.com. As you may know Brooks is part of a team over at Smoking Stogie which dedicates most of its reviews to the newest, rarest, and most expensive cigars you may never get your hands on. So give them a read, they’re well worth it! Now, lets get down to business. 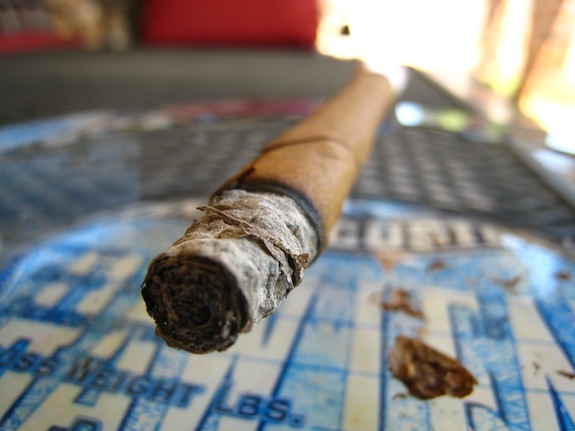 Prelight: Evident through the pre-light pictures, this cigar looks as thought it has definitely seen better days. There is a bit of damage (probably from shipping) on the foot, and the cap of the cigar, but not anything that should really hinder the smoking experience. 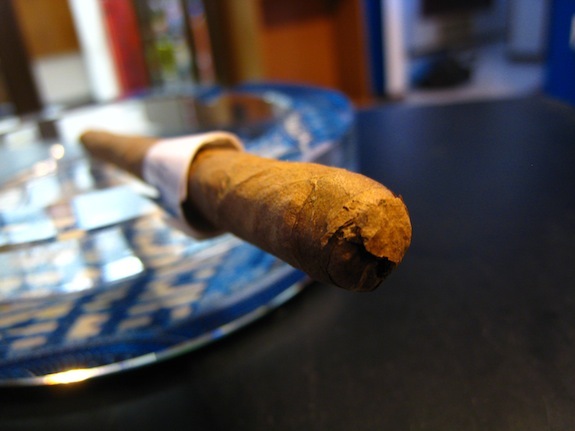 Outside of that the cigar is a really rustic looking on with a milky, light brown, beaten, rustic looking wrapper. There are a few, very slight wrapper cracks as well, but again, nothing too concerning. This cigar is solo light and delicate with it’s extremely skinny body that I am fearful that just handling it may cause more damage. There are man larger veins running through the long slender body up to the tiny round double cap. The body really doesn’t give off any more than a faint grassy aroma while the foot only bears the slightest of tobacco scent. I really can’t pull much of any smell from this cigar. The cap was extremely easy to cut letting out a very unexpected explosion of earthy, woodsy flavors from the cold draw. I figured I’d really have to stretch to get anything from that as well, but it was quite the opposite. First Smoke: surprisingly, despite the slender body, it’s really hard to get a good draw from this cigar at the start. The draw just seems really loose, and most of the air is coming back blank. After we got passed the first inch and compression at the foot, it became much easier to pull back a fuller mouthful of smoke. It still takes a few hits to get the draw that I desire, but it’s much better than the clear air I was getting at the start. Another shocker was this cigar actually packed a lot of sharp, spice notes. Outside of the spice it was easy to pick up lots of natural tobacco, and woodsy flavor. This isn’t a flavor-bomb of a cigar, but so far it’s starting out nice and smooth with some deep flavors. The burnline is very event, and for the size of this cigar it better be. The ash is a very nice white, tightly compacted, and held on for about a half inch before giving way. Which isn’t bad considering how small it is. This cigar is seriously the width of a cigarette. Halfway There: Not a lot of change-ups into the second third. The spice is really the dominant flavor. It’s really nice and puts a very nice overcast on the natural, cashew, earthy, woodsy flavors this cigar gives off. Again, this is spice, not pepper. There actually wasn’t any pepper present at all in this cigar. The retrohale is really freaken good. If gives a really different dimension to the cigar priming my nasal passage with this sweet, sweet, almost gingerbread coating. As far as body is concerned, this cigar is really mild/medium not even giving of the slightest bit of nicotine at this point. Also worth noting is the fact that the draw pretty much doubled going into this second third and is right where I’d like, and expect it. Finish: Wow, what a complete ramp-up in flavors, especially the spice. Now here is where this cigar’s potential was hidden. The main flavor is this just crazy spice. It tastes like how sandalwood incense smells. 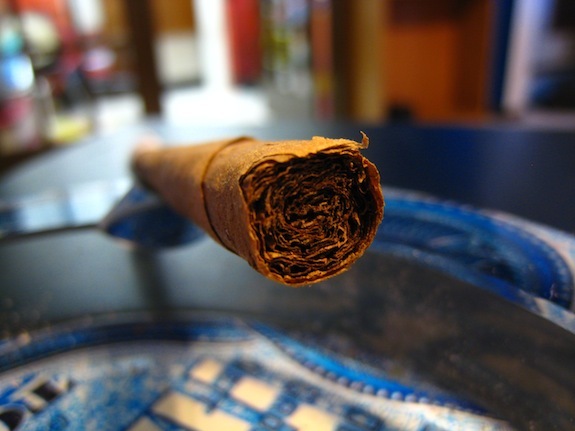 Just underneath is a really deep, dark woodsy flavor, and then the natural tobacco and other earthy flavors underneath. There wasn’t any harshness at all into this cigar that took me a little over an hour to smoke. That’s right, I smoked it that bad (cause it’s hot as hell outside) and there wasn’t any harshness at all. BUT there was something else. A whole hell of a lot of tar build up towards the very end. I only tasted it if my tongue or lips happen to touch it. 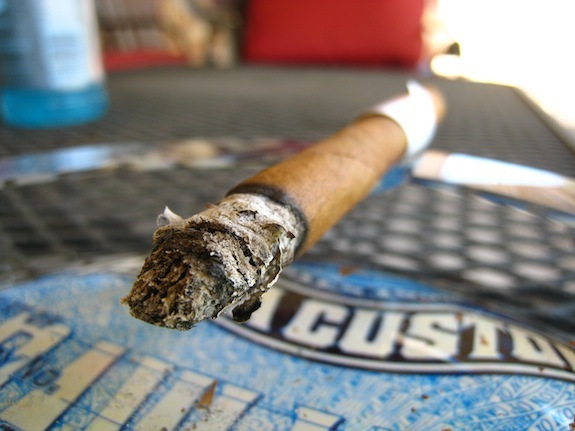 It’s the tar in combination with the saliva that gathered at the head of the cigar. I have to blame the size for that cause generally I am a dry smoker. 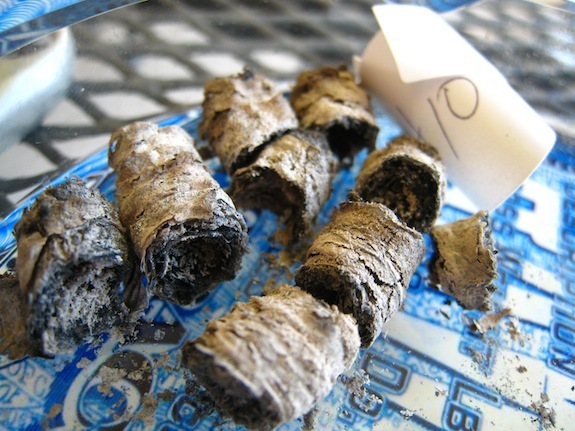 Overview: Sure, the cigar really started out with a certain set of flavors, and ended with pretty much the same set. 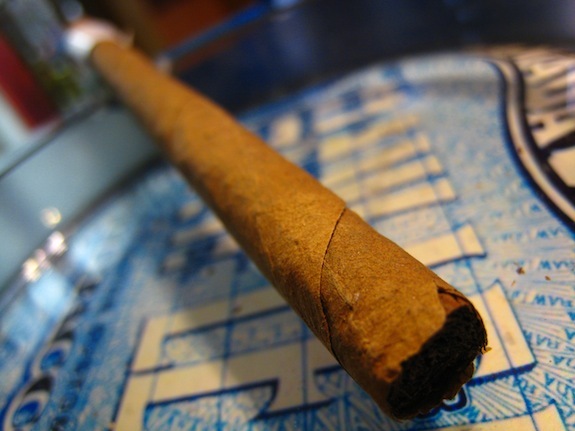 But some cigars don’t really need drastic change-ups to be wonderful experiences. This cigar falls in that category. This ramp up in flavors at the end was nice, and well welcomed. If it had happened earlier in it may have overpowered the entire experience. This cigar is really interesting in it’s own right, and I don’t think I have had anything like that. Depending on price, and age, I’d probably keep these cigars around, but it’s not a cigar I could see myself smoking everyday. It’s just a nice venture into a different type of milder smoke. What did I think it was? Well, I really haven’t had a lot of panetela sized cigars. Maybe enough to count on my fingers, so I will try to guess this one based on characteristics. I’d like to say this is Cuban based. 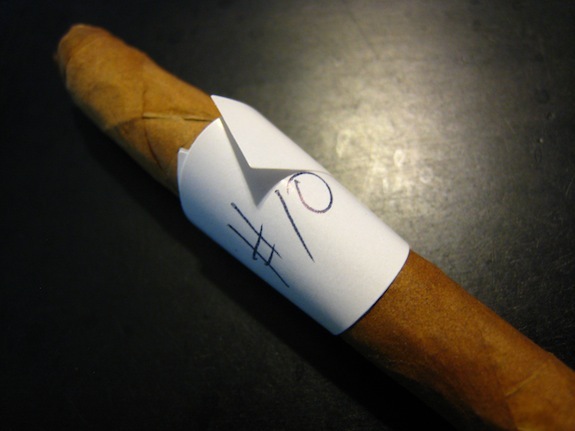 The wrapper is very thing and delicate which is an easy way to identify most Cuban cigars. The burn was similar to a Cuban, but the ash was not. 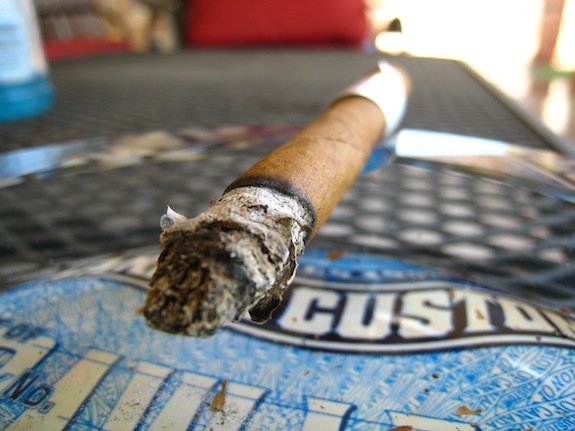 My first guess would be a Cuban Partagas, and if not that, then maybe an old Montecristo. So far I am 0 – 4 in my guesses in this set, so I wouldn’t be surprise if my guess was completely off. And the reveal: Wow, I was actually close on this one. This is a Cuban El Rey De Mundo Panetelas Largas circa 1980-1982. Yup, another old Cuban cigar. This one was almost double the age of the 15 year old Cohiba Brooks sent my way last time coming in at around a whopping 30 years old. I can tell you one thing, Brooks doesn’t skimp out on the good stuff. I tried digging up prices on this cigar and it looks like a box of 25 from 2007 runs about $200. I can’t even imagine what a box from 1980 would go for. Great write-up, Tony. That’s one ancient cigar and an interesting flavor profile. I always look forward to reading these blind reviews. You never know what you’re gonna get, which makes it a lot of fun. Wow. I read this review on the side of a small mountain and couldn’t get enough of a signal to respond. Dude. I could only imagine what it would be to just look through Brook’s stash… Great review and good job smoking something that is almost irreplaceable.. I am envious, yet glad I did not have the responsibility of reviewing that.